How often do people say that its too hard to eat healthy? I hear it all the time and I totally understand why people may think that because on the face of things there are plenty of fancy ingredients and recipes for when we fancy ourselves as the chef du jour. But realistically, the root of healthy eating is simplicity. There is no need to overcomplicate things or slave away in the kitchen. We really can pull together a few simple, fresh ingredients in just a few minutes to create something nourishing for the body as well as delighting our taste buds. Of course, there is room for fancy and it can certainly have its moment, but 9 times out of 10, ease ticks the box for me. This is the simplest dish to make - using just one pan making it the perfect choice for a lazy weekend brunch! 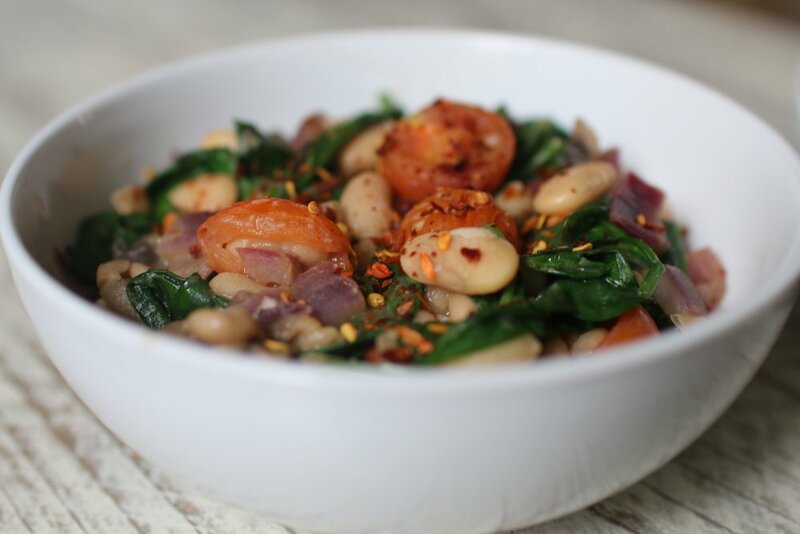 It's also one of my go-to lunches when I am rushing around as it's made from simple ingredients that I always have at home and it is high in plant-based protein which keeps you feeling full and energised. Roughly chop the onions, mushrooms and half the cherry tomatoes. Drain and rinse the beans and set them to one side. Heat the olive oil in a pan and crush the garlic in. Add the onions and let them soften. Then add the mushrooms and as they begin to brown the tomatoes and beans can go in too. Squeeze in the lemon and add the sesame oil, tamari, a little salt and lots of pepper. Finally, add the spinach and stir well so that it wilts, stirring to mix it in with everything else. Remove from the heat once the beans are warmed through and the spinach is soft. Top with chilli flakes to serve.